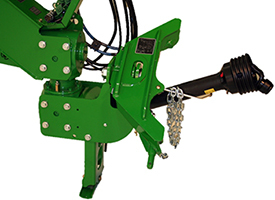 The machine’s swivel hitch gets attached to the lower links of the tractor, which moves the center of rotation behind the tractor's wheels. 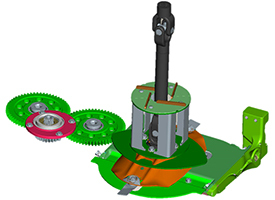 This design, in combination with the swivel gearbox, results in up to a 250-degree movement range of the tongue without touching the wheels of the tractor. This offers great maneuverability during headland turns and mowing of corners. The design of the swivel gearbox offers this versatility at full working torque without generating noise, no matter the drawbar angle. By working across the field, from one side to another, swaths become more parallel and the operator is more likely to use the whole cutting width of the machine. Compared to a side-pull machine, dead time spent traveling on the headland can be avoided. 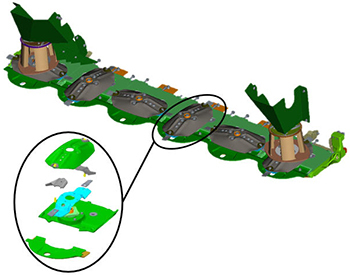 Reducing the traffic on the headlands avoids running over the headland swath several times. Operators will benefit from decreased crop losses, less crop contamination, better forage quality and less soil compaction issues. Based on a calculation with a 3-m (9.8-ft) machine, center-pivot machines provide up to 15 percent more performance. The John Deere cutterbar is made of nodular cast iron. This material has nodular graphite inclusions which provide much more impact and fatigue resistance than traditional cast iron. Nodular cast iron is 85 percent stronger than gray iron. The material properties make it possible to achieve an extremely reliable but thin design at the same time. This low-profile design supports a perfect crop flow and clean cut, even in light crops or in lying forage crop. Replaceable wear caps protect the knife hardware. In case of wear, only the wear caps instead of the whole disk. The John Deere shearhub protects the gear drive in case of a severe impact. The shearhub can be replaced in minutes without opening the cutterbar itself. John Deere offers the 630, 635, 830, and 835 Mower-Conditioners with a quick knives exchange option. This option enables quicker knives exchange operation compared to current methodology using a battery impact tool. Test operators only needed half the time compared to the previous process to change all knives on a six-disk cutting bar. Around 7 minutes were needed to replace all knives compared to around 14 minutes previously needed. 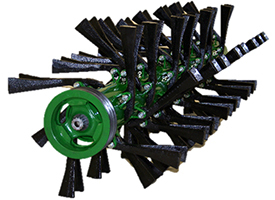 The John Deere impeller conditioner uses preloaded cast-iron tines to condition the crop. Compared to mobile free-swinging steel tines, operators benefit from a low cost of operation because of the durable design of the tines and the reduced wear on the attaching bolts. The preloaded design allows the producer to equip the conditioner with heavier tines. This allows the tines to carry a greater load. This is a huge advantage, especially in heavy crops, because the crop acceleration is much better and the windrow shape is improved. The preloaded design of the impeller affects the impact angle to the crop flow coming from the cutterbar. The tines catch the crop immediately behind the cutterbar at a 90-degree angle and accelerate it toward the conditioner hood. This design, combined with the huge number and dimensions of the tines, leads to much friction between the stalks of the crop. This results in the desired effect - the crop structure is not damaged but the wax film of the crop is removed. Much faster drying down occurs. To adapt to different yields and crop conditions, two parameters of the conditioner hood can be adjusted. Every impeller shaft of a John Deere mower-conditioner is individually balanced for more uptime, less bearing wear and increased machine lifespan. The John Deere rotary rolls conditioner uses urethane-chevron rolls to provide gentle conditioning to fragile and leafy crops like clover or alfalfa. Due to the specific, interlocking design and the material properties of the rolls, crops are conditioned in the proper way; stems of the crops are buckled while ensuring leaves stay linked to the stems. To offer maximized versatility, roll distance and pressure can be adjusted quickly and easily to meet varying field and crop conditions. The large diameter of the rolls and the synchronous drive of both rolls via the gearbox make the machine suitable for high yields and various conditions. The height of cut (HOC) is affected by two parameters. One parameter is the length of the turnbuckle on the right-hand side of the machine, which controls the angle of the cutting unit to the ground. 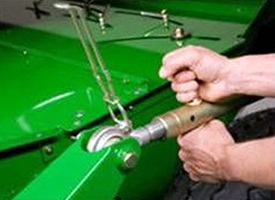 For more versatility and operator comfort, a standard turnbuckle can be exchanged against a hydraulic cylinder which provides HOC adjustment from the cab. The second parameter affecting the HOC is the setting of the gauge shoes. 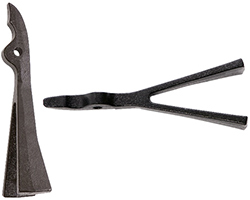 Operators can choose from three gauge shoe settings. To increase the HOC above 95 mm (3.7 in. ), gauge shoe spacers are available. The operator can set the HOC between 20 and 165 mm (0.79 and 6.5 in.). For more information, see mower-conditioner attachments. The cutting platform is suspended by two large springs at each side of the machine. Each spring is linked to a crank which allows the operator to set the ground pressure for the floating cut. The comfortable, easy, and reliable system allows the operator to set as much ground pressure as needed and as little as possible. This ensures a perfect cut with low cost of operation due to smooth running and low drag resistance. The floating cut and the perfect ground contour following helps the operator reduce the stress on the turf for faster regrowth and less crop contamination. All this leads to better forage quality due to better fermentation and less crude ash content, which creates huge operator value. 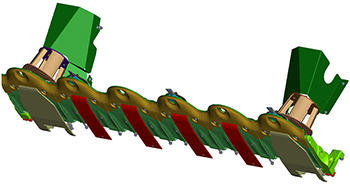 The parallel kinematic chassis design, in combination with the spring suspension, offers excellent ground contour following. The wheels of the machine are very close to the cutterbar. This supports the ground contour following. Ground pressure is adapted to changing conditions with very short delay. 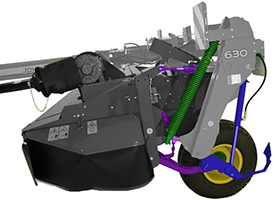 The cutterbar design, in combination with the ground pressure setting and the overall chassis design, helps operators lay the foundation for superior forage quality in combination with low cost of operation thanks to the machine lifespan and fuel savings created by low drag resistance. In addition to outstanding floatation performance, the chassis and suspension concept provides uncompromising protection from damage by foreign obstacles in the field. 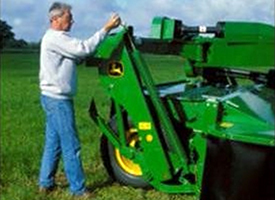 In case of unintended contact with an obstacle in the field, the mowing platform can move upward and backward. The design of the kinematic chassis allows for a fast return to the operating position once the obstacle is overcome. No matter the weather conditions, which crop or which harvesting operation followed, or if operated as single machine or in combination with a John Deere front unit, John Deere offers a suitable windrow solution for every operator’s needs. 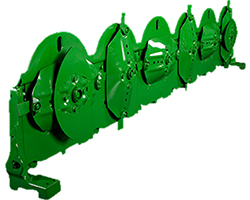 Widespread for even faster drying down, windrowing solutions include standard windrow forming shields for light and edgy windrows, hydraulically-powered windrow forming shields for harvesting with a self-propelled forage harvester (SPFH), or a mower-conditioner equipped with a grouper for windrowing large working widths to a 1,5-m (4.9-ft) swath. All the operator has to do is to pick the appropriate solution that fits their needs and conditions. Two or more options can be chosen to meet the requirements of different operators, and the operator can switch between them in minutes.